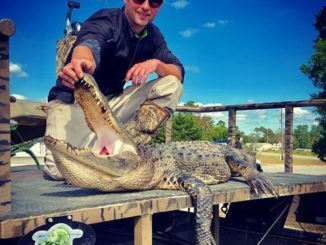 If luck was in any way involved in Ryan Pridgen’s success at bagging an alligator in North Carolina’s first gator harvest season, it was only in being chosen for a tag. Him killing the lizard was anything but luck; the Raleigh sportsman spent enough hours, time, and energy to locate and kill the gator that he’d qualify for overtime if the whole thing was a job. 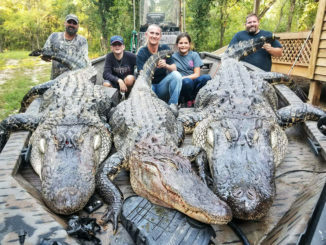 On South Carolina’s opening day of the 2018 alligator hunting season, Daniel, Jennifer, and Justin Cunningham, along with Rutt and Candice Iusti left Santee empty-handed and headed back to the upstate after a long but fruitless encounter with a big gator. But they went back this past weekend and filled their tag with a 13-foot, 6-inch beast that weighed 1052 pounds. 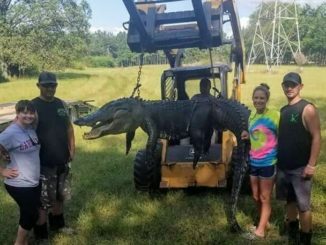 Jeremy Shealy of Pomaria and Chapin’s Hunter Neeley killed a giant alligator in the swamps of Santee on South Carolina’s opening day of 2018. 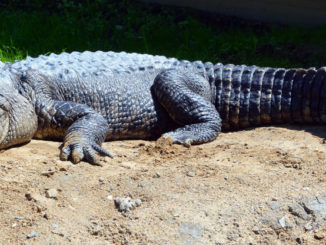 The gator measured 13 feet, 2 inches in length, and weighed 1012 pounds. 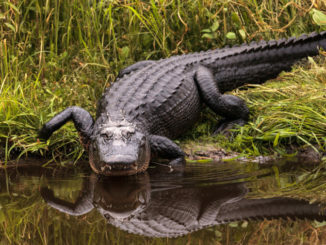 The N.C. Wildlife Resources Commission is offering permitted hunting opportunities for alligator population reduction hunts in three designated areas of Hyde County only. 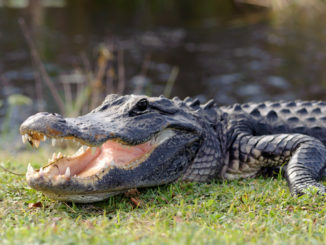 Hyde County requested a targeted hunt to reduce numbers of alligators in areas of Swan Quarter, Fairfield and Engelhard with frequent alligator conflicts. If you haven’t already applied, there are only two weeks left to enter the 2018 Public and Wildlife Management Area (WMA) Alligator Hunting season lottery drawing. 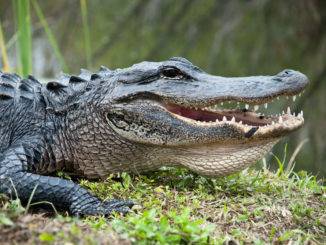 Beginning May 1st, the S.C. Department of Natural Resources (SCDNR) will begin accepting online applications for the 2018 Public Alligator Hunting season and the 2018 Wildlife Management Area (WMA) Alligator Hunting Season at www.dnr.sc.gov/wildlife/alligator/index.html. 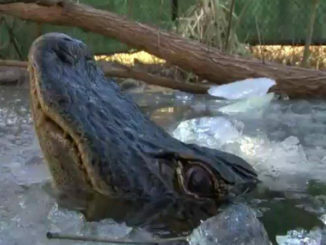 Alligator hunting application deadline extended to June 1 for N.C. The N.C. Wildlife Resources Commission is extending the application period by one month for permitted American alligator hunts for the September 1 to October 1, 2018 season. Cities, towns and villages within the North Carolina Alligator Management Plan’s designated Alligator Management Unit 1 (Brunswick, Carteret, Columbus, Craven, Hyde, Jones, New Hanover, Onslow, Pamlico and Pender counties) now have until June 1, 2018 to submit an application. 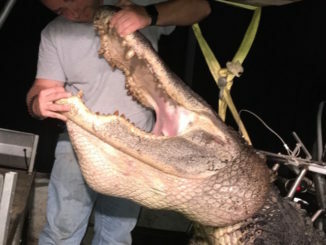 The NCWRC has given initial approval of an alligator hunting season for part of the state, but all the details haven’t been ironed out and explained to hunters just yet. 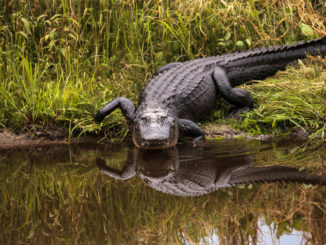 Much of the first season will depend a lot on input from municipalities within the Alligator Management Unit 1, which includes several Coastal Plain counties. 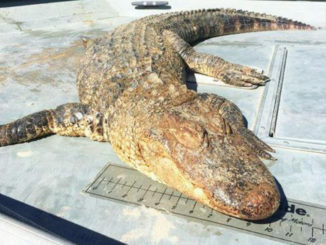 According to the North Carolina Wildlife Resources Commission, a dead alligator was found in Lake Wylie near the Hwy. 74 bridge in Belmont, N.C. by two brothers who were fishing from their kayaks on Sunday. Filling an alligator tag is a dream come true for many South Carolina sportsmen — filling 3 on the same outing is nothing short of incredible. But, that’s exactly what happened for Buck Koon of Gilbert, SC and Jason and Amy Kirkland of Leesville, SC. On opening day, Sept. 9, they set out on Santee Cooper’s Lake Marion and got the job done with a 9, 11, and a 12-foot gator. The N.C. Wildlife Resources Commission board approved the N.C. Alligator Management Plan at its business meeting in Raleigh on Thursday.